In his Oscar-nominated film Food Inc., Robert Kenner took on the American food industry and revealed how industrial production is making the nation less healthy. With Fast Food Nation author Eric Schlosser as a co-producer and Omnivore's Dilemma author Michael Pollan as a consultant, Kenner's film takes consumers on a journey from the supermarket aisle to meat-packing plants to Congressional food-safety hearings to demonstrate how a handful of corporations often put profit ahead of consumer health, worker safety and the livelihood of the American farmer. 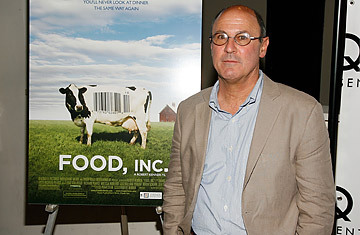 Now that Food Inc. is back in the spotlight with an Oscar nomination, have you had to deal with more complaints from companies that you call out in the film? In a funny way, the complaints came before we were released theatrically. After great theatrical success, we went on Oprah and became the No. 1 DVD on Amazon in the country. All of a sudden I think these companies  so many of them who wouldn't talk to us  had to start to take this issue seriously to understand their consumers are concerned. You were inspired to make this film after reading Fast Food Nation. How were your expectations of the industry different from what you eventually learned? I had wanted to do a documentary on Fast Food Nation, but people said, Wasn't the Morgan Spurlock film, Super Size Me the documentary [version]? So it became important for me to make a film about how the whole supermarket has become industrialized like the fast-food system. On one level, we're spending less on food than at any time in history, but it's coming to us at a very high, unseen cost. And I think we're just beginning to understand that. Ultimately, the most shocking things in this film were when Barb Kowalcyk told me that meat producers knew where the meat that killed her 2-year-old son came from and it sat on the shelves two weeks after he died  and the government did not have the power to recall it. Another was when I went to the hearing on whether we should label cloned [genetically modified] meats. I didn't even know there was such as thing as cloned meats. When a representative said, I think it's not in the consumer's interest to give them this kind of information and that it would be too confusing to the consumer, that made me realize that we were making a film that was about more than just food, it was about our rights. Ultimately it [comes down to] "veggie libel." We've gotten to the point where food products have more rights than we do as individuals. Corporations are getting too much power. Their only interest is profit. That profit is leading our society to a bad place. The similarities to what happened in the financial meltdown are all too frighteningly similar. Can government make changes at the corporate level? Unfortunately there seems to be such a paralysis in government these days. I think Eric Schlosser's analogy about tobacco is a really important one. We were up against really powerful corporations, and ultimately they had great connections to government. But when we began to learn that nicotine really wasn't good for us, we were eventually able to put laws in practice that could tax and charge the real price for that product. I think as we start to understand these high, unseen costs, hopefully we'll start to put the real price on cheap food. We're paying for it with our tax dollars for subsidies and we're paying for it with our tax dollars for health care. So it's a combination of individuals and better laws? Right. I think on one level we can do it individually by eating in season, going to farmers markets, buying local, buying organic, reading labels, buying less processed [foods]. But as Michael Pollan says, we need to create a fair and balanced playing field where the carrots are as cheap as the chips. I would say we have an élitist system where we're encouraging poor people to eat food that's just unacceptable by unfairly pricing it.